Follow along with Mermaid Phantom's magical adventures. Expect lots of talk about fairies, mermaiding, nature, creative DIY projects and living a fairytale lifestyle. There will be plenty of pictures, videos, and other fun stuff too! It's a mermaid's life for me! I tried to convince myself that this was all just a dream, and that I was really passed out on a cozy rock somewhere in Lake Michigan. But, when the land-ship came to a sudden halt and I was hoisted off of the ship by a gang of pirates, I knew that I was definitely not dreaming! Luckily, the pirates that carried me away to an area flooded with festive music were very gentle, kind and strong! They didn't drop me and they didn't even scuff my scales against the red parade vehicle. At first, I was worried that they were taking me to meet their captain, but then they put me in a big cave (called a "tent") with a bunch of human children. The children were very sweet, and a few of them grabbed my arms and "danced" with me to the music that filled the air. As it turns out, pirates aren't such bad singers! Even though I was a captive, I will admit that I did enjoy listening to the music of those swashbucklers... and their jokes were pretty hilarious! While in the tent, some of the human kids tried to give me their treasure that they stole from the Boyne City Pirates, but I was too scared to take any, since I figured my jailers wouldn't be pleased if I was found with stolen goods. The parents of the children also asked me to smile at these black boxes called "phones." Humans are SO weird! However, I saw no harm in sitting with the children and smiling at all of the boxes. After all... if smiling made the "phones" happy, I didn't want to disappoint them. I smiled, and smiled, and smiled until I got REALLY dried out. I needed to get back to the lake before I would be transformed into a human!!! When I was realeased into the water, a few of my mermaid friends (who had also been captured) were waiting for me by the boat-launch. I was SO happy to see them!! We were getting ready to swim away when all of these human families started gathering around the shoreline to stare at us. Didn't they know that staring is rude??? Oh well... they seemed harmless and we knew that we could out-swim them, so we stuck around for a while to entertain them with fins slaps and tail tricks. They loved it!!! 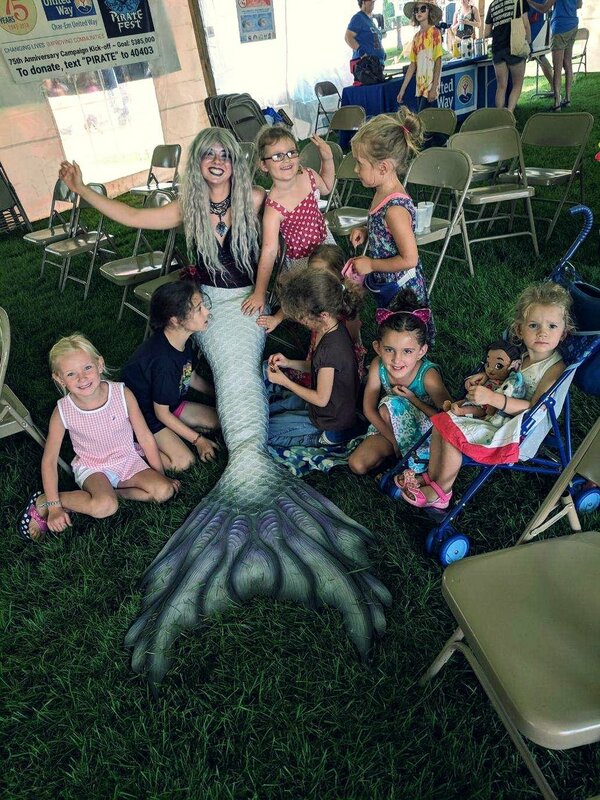 Many of the humans had never seen real mermaids before, so they had tons of questions for us. And again... some asked us to smile at their black boxes called "phones." Phones must be very sad creatures. They seem to need a lot of smiling to cheer them up! Want your own stories to tell? Join the crew in celebrating the Boyne City Pirate Fest next year. Learn more by clicking HERE. Traverse City Mermaid for Hire! Mermaid Parties, Pool Parties, Underwater Performances & More! Make it magical, make it memorable! Hire a mermaid for your event!